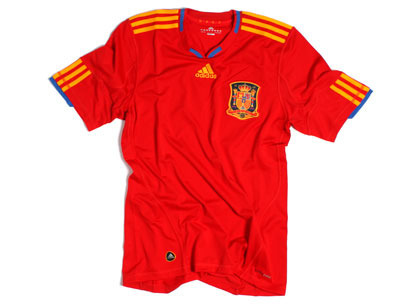 This is a leaked photo of Spain’s new adidas home shirt for 2010. The Spanish national team will wear it for the first time on Saturday, when they play Argentina at the Vicente Calderon, in a friendly which celebrates the centenary of the Spanish football federation. Spain v Argentina – now that is a tasty fixture. You like the shirt? I think it’s tasteful but rather uninspiring. I’m sure it’s not long [Confederations Cup maybe?] since they unveiled their last new kit. This one looks a bit too ‘duplo’ for my liking. Spain need to calm down on the whole kit thing. I prefer the one the had for the Confed cup. Yep i agree. A bit loud this one. since they unveiled their last new kit. This one looks a bit too ‘duplo’ for my liking.